A mayfly flies through the air over a body of water and spends and ends its life over hours or at most a few days. To us humans, the mayfly’s lifespan is a mere flash in the pan, although it may seem quite long to a mayfly. This little insect doesn’t even notice that something has changed on our world. Does it know that the Sun rises in the East, reaches a peak midday, and sets in the West? Probably not. An oak tree is similarly unable to notice how its fresh, green leaves come to be in the Spring and how its colorful, falling leaves turn in the Fall. 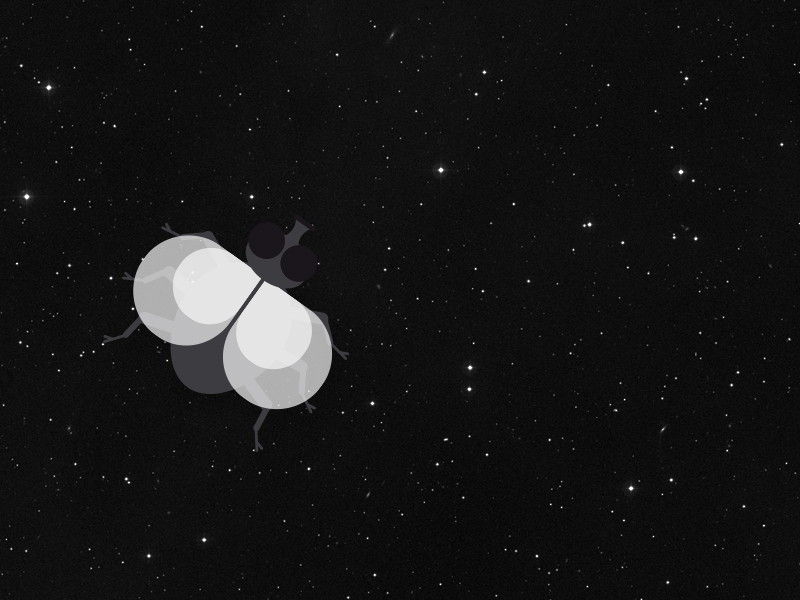 Whether you believe it or not: the mayfly has plenty to do with us and the stars. We human beings are in a sense mayflies – well, from the perspective of the Universe. The stars appear to us to be stationary in the night sky. In centuries past, humans thought the stars did not move, at least until astronomers followed the stars more closely and noted their positions. These astronomers concluded: not only our Earth and the other planets, but also the stars move. Even our Milky Way as well as the Universe, itself, is in motion – a notion which was discovered by the astronomer Edmund Halley in 1718. The fixed star is a term from antiquity… and it is false. In another century, any change from our perspective won’t be obvious. The cosmos, observed by our naked eyes (or with Universe2go), remains unchanged. Of course, everything is really in motion! Of course, motion of the Universe and all its contents occurs every day and this motion is connected to the rotation of the Earth. The stars ‘rise’ in the East and ‘set’ in the West, while every season shows us a different picture of the night sky, because we see varying regions of the Universe throughout the year. Yet, in this case, we are the ones who move. Stars, themselves, move around the center of the galaxy over millions of years. Within it all, various stars move a differing speeds. Astronomers discovered that the stars from our perspective more towards or away from us. This entire process is called ‘radial velocity’. The change in terms of the system of coordinates is called proper mobility. Both are important, in order to predict the movement of the stars. Many people who have seen it can identify the big dipper. 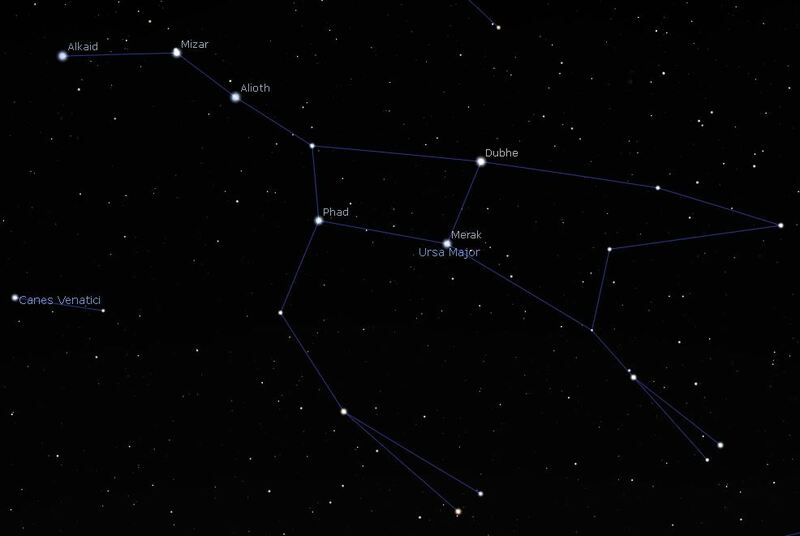 What we call the Big Dipper is actually part of Ursa Major, or the Great Bear. But, what would happen if we took a trip into the past – say 50,000 years – to the time of Neanderthals? What would it all have looked like? 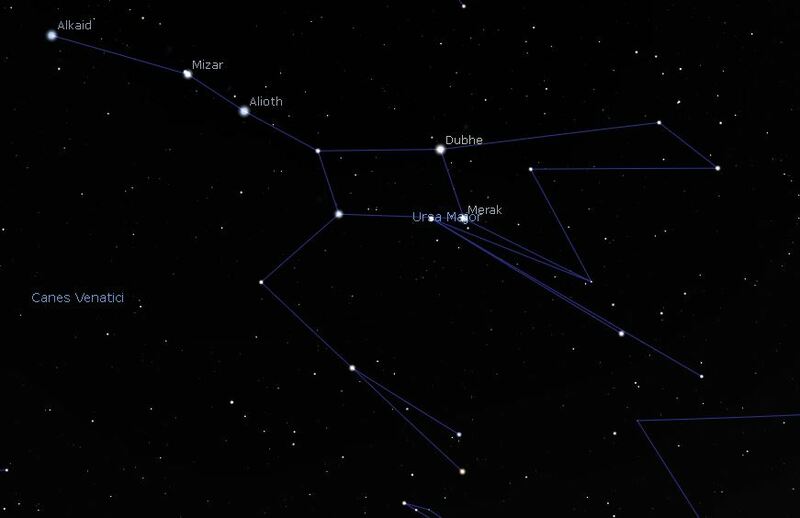 The Big Dipper and Ursa Major 50,000 years ago. We can stand on the Earth at the same point and look at the night sky. 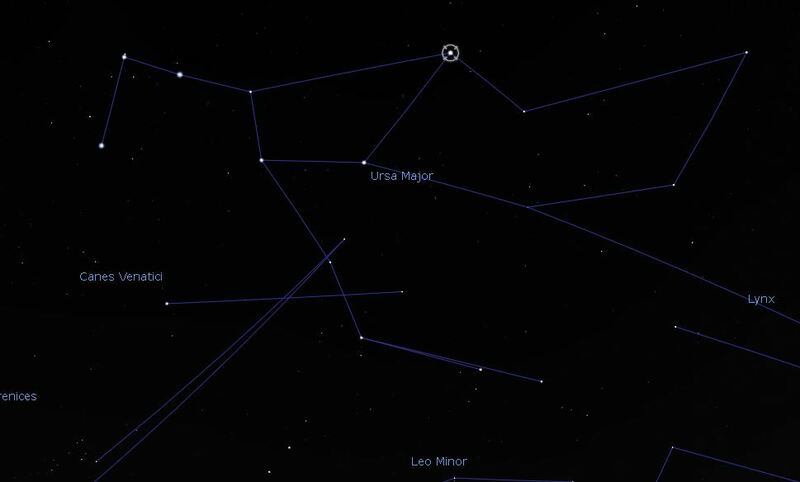 Can you recognize Ursa Major or the Big Dipper? If the constellations lines were present, perhaps not. Somehow the constellation appears stretched and the stars are found at other positions. Back to our future and the constellation is luckily back to its old self. What we see at night now. What if we turn the clock forward, let’s say to the year 100,000. Maybe humans travel between solar systems, perhaps even galaxies. Maybe we have left the Earth, maybe not… maybe our beloved home doesn’t exist any more. The same can’t be said for the stars. They will certainly still be there. The Big Dipper and Ursa Major 100,000 years into the future. As you can see, the shape of the big dipper and Ursa Major has changed significantly. A striking difference is that the star Alkaid takes up a significantly different position in the sky, than say Alioth. This star belongs to a group of 150 stars, which are moving together in the opposite direction of Alkaid. The group moves together towards a vanishing point in the constellation Sagittarius. Obviously, there are many stars that have proper motion and some of those stars belong together, wandering simultaneous through the Universe. Much like the mayfly doesn’t note many changes that we see and experience, we too are unable to see those in the Universe. The most important point is, however, that we enjoy and take care of what we have here and now on Earth as well as in the sky.